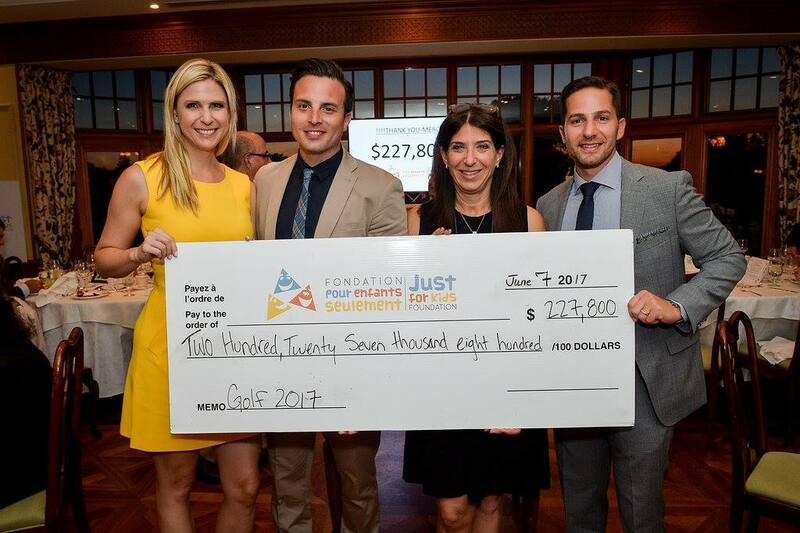 On June 7th, 2017, the Just for Kids (JFK) Foundation held its annual Golf Tournament and Cycling Tour at the prestigious Royal Montreal Golf Club. The golfers and cyclists were welcomed with a gourmet brunch at the clubhouse before setting out for a shotgun start to the day’s events. The golfers enjoyed refreshments, an abundance of snacks including delicious mini waffles from the Gaufrabec food truck, beer provided by McAuslan brewery, pizza from Tastes of Italy and many different drinks and snacks from Servomax, and various contests as they made their way through the Championship Blue course. The cyclists selected one of three routes, 60-65 km, 75-80 km or 100-110 km, as they were led on a guided ride, enjoying the beautiful landscape of Île-Bizard and the West Island on their bikes. The participants then met back at the clubhouse for cocktails and canapés. The evening culminated with a mouth-watering four-course dinner and a live auction hosted by Chantal Desjardins. The event chairs were thrilled to present Just for Kids Foundation with a cheque for $230,000 – a golf and cycling fundraising record! Funds raised from this signature event will go towards JFK’s 2017 campaign, A Breath for Life. Thank you to the event committee, volunteers, donors, sponsors, golfers, cyclists, title event sponsor TD Wealth – Rodier Asset Management / TD Commercial Banking and top sponsors Aon Insurance, Goldberg Wealth Management/ ScotiaMcLeod, Kaycan and Felicia & Arnold Aaron Foundation for making the JFK Golf Tournament and Cycling Tour an outstanding success. As well, thank you to our top three cycling fundraisers: Derek Silverman, Danny Sedra and Ramy Sedra. Their fundraising efforts will make a great impact in helping us help the kids at the Montreal Children’s Hospital.